Geely said the famous Swedish premium brand will remain true to its core values. Ford: Deal provides "a solid foundation for Volvo to continue to build its business"
(CNN) -- Chinese carmaker Zhejiang Geely Holding Group has purchased Volvo cars from U.S. auto giant Ford, the Swedish carmaker announced Sunday. The $1.8 billion deal represents the biggest ever purchase by a Chinese car manufacturer, but it is considerably less than the $6.4 billion Ford paid for Volvo in 1999. "We are pleased to have reached this agreement with Ford, enabling us to safeguard and strengthen Volvo's renowned brand heritage," said Geely chairman Li Shufu. "This transaction will ensure Volvo's continued leadership in the premium sector, where it enjoys a global reputation for safety and environmental-friendly technologies. "This famous Swedish premium brand will remain true to its core values of safety, quality, environmental care and modern Scandinavian design. "Volvo will be a separate company with its own management team based in Gothenburg, Sweden." 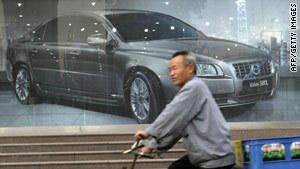 He added Geely will help Volvo to realize its potential in the Chinese market. "The agreement provides a solid foundation for Volvo to continue to build its business under Geely's ownership," said Alan Mulally, Ford's president and CEO, in a statement on the company's Web site. "The sale of Volvo will allow us to further sharpen our focus on building the Ford brand around the world and continue to deliver on our One Ford plan serving our customers with the very best cars and trucks in the world." Ford will continue to work with Volvo in the interim to allow a smooth transition of ownership.